Incident Reporting, or security alerts, from the residents or employees of security guard company customers is a layer of security that 95+% of your competitors cannot offer! The Community Security Portal is like an electronic, instant alert, neighborhood watch system. Imagine being able to receive an alert from a resident, employee or teacher if they witness a security concern. 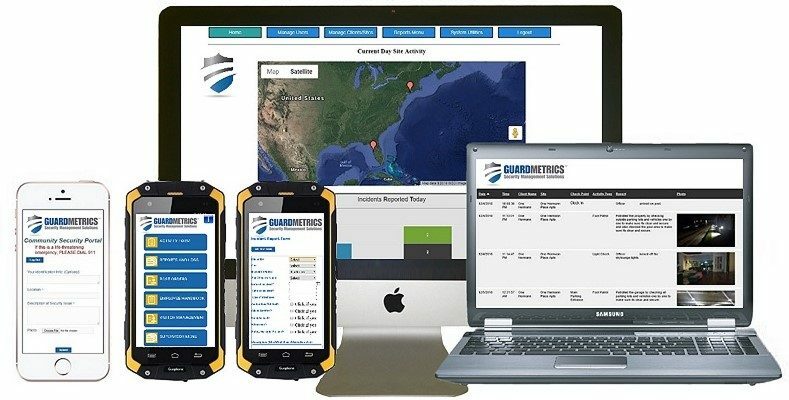 GuardMetrics is very pleased to make the Community Security Portal digital neighborhood watch system available to any of your security guard service customers that you wish to share the app with. Very simply, an employee or resident given access to the system can login from anywhere, and from any device, with a password and username assigned to that site. That resident can then dictate, or type, a brief description of their security concern and click submit. That alert then goes to an email address that you designate, to alert you in real-time, along with any personnel or stakeholders that you include, on your mobile devices. DEMO this employee incident reporting and resident security alert system / neighborhood watch system that will set you above the competition! Allowing an employee of a company or government facility, or a resident of an HOA, condo, or apartment, etc. to submit a security alert is not common. The technology involved has been over-complicated and so the price point has been driven up. This kind of technology is now generally available only in large corporations that have a million-dollar PSIM system in place, in which employee incident reporting is a small part. So what if your security guard company could deliver an electronic neighborhood watch system app and security alert abilities for concerned residents or employees as part of your security officer business service bids? The question sounds rhetorical because the answer is so wonderfully obvious: If your security guard company is able to bring electronic neighborhood watch alert capabilities to the table, and still keep your price-point near your competitors, then YOU are the only choice! Provide better security for your customers with residential & employee incident reporting and security alerts through this digital neighborhood watch system and app! What about identity/ anonymity concerns? Studies (and common sense) have shown that folks are a lot more likely to report a security concern if they aren’t afraid that police and/ or security will be knocking on their door to get more details. This thinking is logical, of course, as the very neighbor that they may be reporting may be watching from their window. The GuardMetrics Community Security Portal / neighborhood watch security alert app has only two required fields, as shown on this page. The first field, where the resident or employee can include their apartment number, or phone number, or department, etc., is optional. If the individual would like a call and doesn’t fear reprisal, then they are welcome to dictate some information there. The second field requires simply a “building K parking lot” or some general location description. Then, a brief dictation of the concern. The resident or employee can even attach a picture with one click (imagine that! ), and touch “submit”! The whole process can be done in a matter of seconds, making for a safer residential or workplace community for all. It’s that easy! Call us, or click here, to provide employee & resident incident reporting and security alerts with this state-of-the-art neighborhood watch system! So, which of your clients could benefit from a community security guard alerting system? ANYONE who has a community of any sort that can help create an “electronic neighborhood watch system”! Then, how will it benefit your security guard service to provide this invaluable additional layer of security that other security guard companies cannot provide? WIN & KEEP MORE BUSINESS (and make the right margin)! Call GuardMatrics now to provide a simple guard alerting neighborhood watch system & app to the wards of your clients.